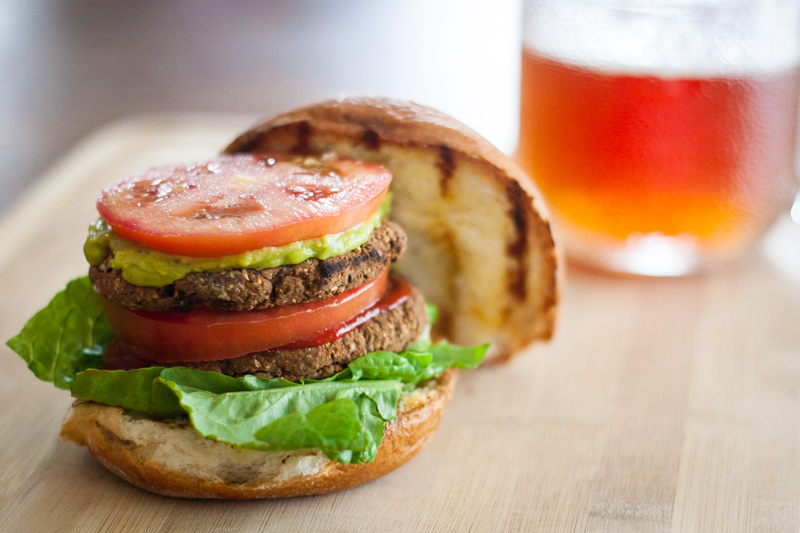 Every vegan and vegetarian cook knows that an important recipe to have in their arsenal is a foolproof black bean burger. Sure, they sell a bunch of frozen versions, but you know that yours is better. And an extra problem for us vegetarians with celiac disease is that 90% of the pre-made veggie burgers in the supermarket (and at restaurants…good to know) are NOT gluten-free. 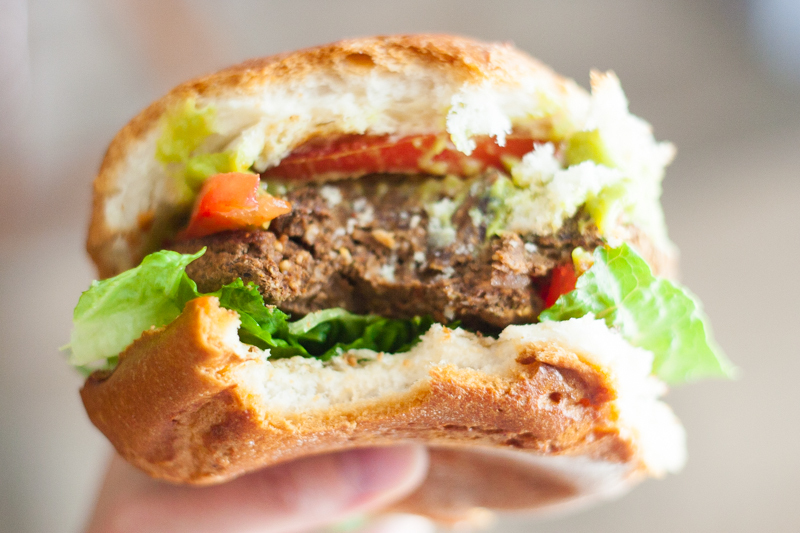 I have struggled with creating my foolproof burger for at least a year…seriously. 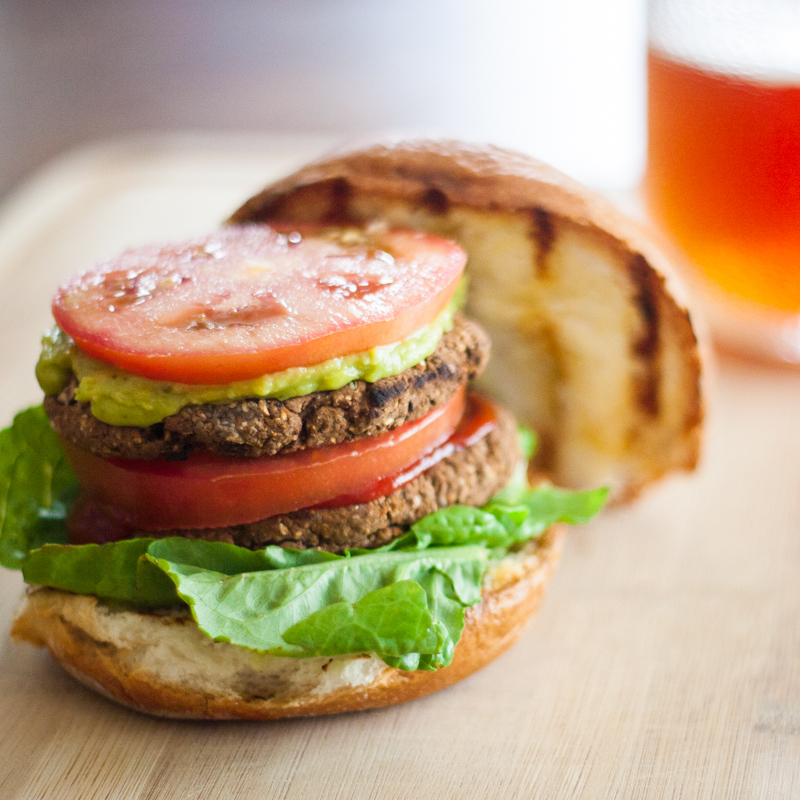 I really wanted to make it vegan as well as gluten-free, but it turns out it is tough to make a burger that will hold together on a grill without egg and/or gluten. Most of the versions I made would hold together if I baked it, or turned it very, VERY carefully in a skillet, but that’s just no fun. I actually wrote this recipe over the summer, and just somehow forgot to post it! Was probably too busy stuffing my face. Start by mixing the chia seeds and water in a small bowl. Set aside and let sit for at least 15 minutes. Pulse the oats in your food processor until it’s a powder-like consistency (you’re basically making oat flour). Add 2/3 of the black beans, olive oil, garlic powder, chili powder, cumin, cilantro, cayenne, and paprika. Blend until smooth. Add in chia gel and remaining black beans. Pulse processor briefly, or mix with a spoon, just to incorporate all ingredients. Lay a sheet of wax paper on the counter. Divide the black bean mixture into the number of patties you want, and form the patties with your hands. Lay on one side of the wax paper and fold the other side of the sheet over the burgers. You can store them like this in the fridge or freezer if you do not plan to grill them right away. The mixture will make at most 4 patties, but I have also used this recipe to make 2 gigantic burgers…totally up to you! You can grill on high on a stovetop grill pan or outdoor grill. Either way, you will need to oil the grill slightly, to prevent sticking. I usually just pour a bit of canola oil on a folded paper towel and wipe down the grill grate. Please don’t light your hand on fire. PRO TIP: To make your burger extra awesome, brush a little bit of olive oil or melted butter on the inside of your hamburger bun. Sprinkle a little garlic powder and dried oregano over that, and put facedown on the grill for a couple minutes. And bam, now you have a garlic bread bun. You’re welcome. Use your favorite toppings and choose your favorite bun! I usually go for an Udi’s Gluten Free Hamburger Bun with lettuce, tomato, and lots of guacamole. Feel free to make it a double like I did…no judgments here.